The Spurs played their starters for much of the game against the Trail Blazers’ bench, but the Spurs blew it at the end with a bad turnover and an improbable bounce led to a buzzer beating layup by Noah Vonleh to give Portland a 99-98 win. On paper, this was no contest. The Portland Trail Blazers, after wrapping up a playoff spot in their previous game, were resting almost all of their top players. Damien Lillard and CJ McCollum were replaced with Shabazz Napier and Evan Turner—who played the best basketball of their careers tonight. Allen Crabbe’s minutes were taken by Pat Connaughton who played his best game as a professional. The truth is that the Blazers young players played with a lot of desire and skill, while the Spurs starters seemed to take for granted that they were entitled to a win. The Blazers reserves played with a lot more crispness than the Spurs starters. Even though they were outplayed for most of the game, it seemed like the Silver and Black were going to be able to pull out a win when Jonathon Simmons elevated over Meyers Leonard and slammed the ball into the basket right through his outstretched arm with a minute and a half left in the game. And then when Kyle Anderson made a tricky layup to put the Spurs up 96-91 with 1:24 on the clock, it looked like the Spurs had done enough to escape with a victory. But as we have seen before, a 5 point lead late in the game isn’t always a sure thing for the Spurs. The Spurs allowed the Blazers to score quickly on their remaining possessions, with Layman, Connaughton and Vonleh making shots in the final minute with the only Spurs scoring being a pair of Kyle Anderson free throws. Still, the Spurs still had a one point lead with 6 seconds left with the ball. Anderson tried to throw the ball ahead to Simmons under the basket, but it was just beyond his reach and it went off his hands for a costly turnover. Portland, with just 6 seconds to score, inbounded the ball to Napier, who lost control of the ball with time running out. As the ball bounced slowly to David Lee and Kyle Anderson, somehow it slithered between them … directly to Noah Vonleh, who picked it up and laid it into the basket, letting go just before the clock expired. The Blazers had somehow won the game, 99-98. It was a fitting end to a game where the Spurs did everything to lose the game, and somehow seemed poised to win it in spite of themselves. It was a bit of a lucky bounce, but the Blazers, who had played harder and better than the Spurs for most of the game, got the win that they deserved. This is fine. The Blazers started the game hitting just every shot they took and they rushed out to an early lead. The Spurs kept close with Kawhi Leonard and LaMarcus Aldridge hitting shots. The Blazers let 31-28 after one. The second quarter started with an amazing display of inept offense by both teams, as between they missed 20 consecutive shots before Evan Turner finally hit a shot for the home team about 5 minutes into the quarter. The Spurs were doing some odd things on defense, like a zone defense for part of the time, and it’s tempting to give that credit for the lack of scoring, but it really was that both teams couldn’t hit anything. The last part of the quarter was a little less terrible, as both teams began to hit shots and at the half, the Blazers led 47-43. The Blazers continued their hot shooting and energetic play to start the third, with Evan Turner leading the way with 13 point in the quarter. But the superior skill of the Spurs starters began to take over and halfway through the quarter, the Spurs had taken the lead—65-60. Satisfied that the starters had had enough practice, Coach Popovich pulled them from the game and brought Kyle Anderson, Manu Ginobili, Patty Mills, Jonathon Simmons, and Pau Gasol. After three quarters, thanks to a Manu stepback shot late, the Spurs led 76-71. In the fourth, Davis Bertans and Bryn Forbes finally got some run, and played well. But the Blazers continued to fight and keep the game close. The Spurs missed some opportunities to put the game away with missed dunks and bad turnovers, but it was decided in the last minute with the critical plays. You can read how that went by reading the summary above. 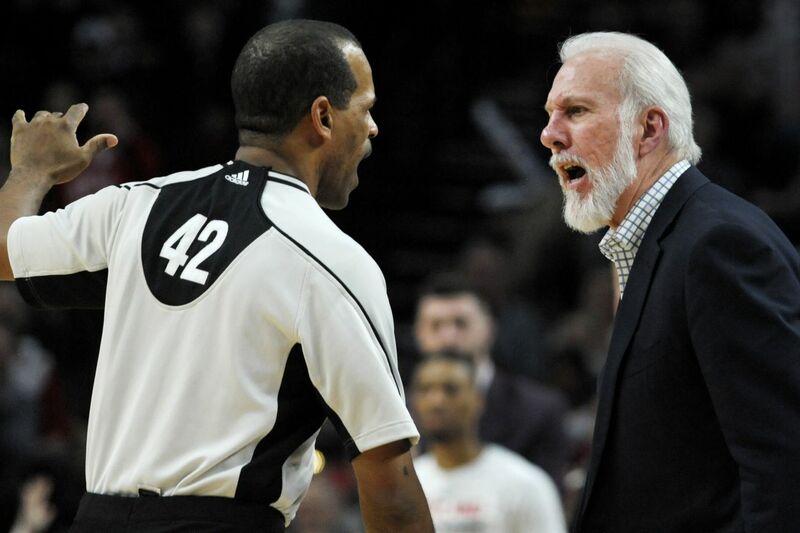 Spoiler: The Spurs failed to execute late, and it cost them the game. Danny Green had his first game back after a 5 game absence and he didn’t play badly, but he also didn’t have a big impact on the game. Shabazz Napier had a spectacular game, with 30 points and 6 rebounds. The Portland fans were booing LaMarcus Aldridge just about whenever he touched the ball, which didn’t seem to bother him much. The Spurs starters all played about 20 minutes, and didn’t play badly, but were outplayed by the Blazers reserves who had something to prove. Pop took his starters off the court midway through the third quarter with the Spurs up by 5. The Spurs reserves finished out the game with a lot more intensity that the starters, but key mistakes in the last seconds opened the door just wide enough for the Blazers to sneak out a win late. Davis Bertans made some really good plays on both ends of the floor. I hope he gets some run during the playoffs, because he has shown he can be a difference maker. There were a series of really questionable calls in the fourth quarter which kept the game in reach for the Blazers, including a fast break where David Lee was obviously fouled on a layup. But it should have never been that close to begin with. This is my final recap of the regular season. I was scheduled to recap the game on Wednesday, but Michael Erler switched with me because he had a schedule conflict. So it’s his fault that I had to cover this horrible, no good, very bad game. I shake my fist at you, Erler! The Spurs did have some good moments in this game, like this nice block from Davis Bertans. This was the play that looked like it might win it for the Spurs, as Simmons takes it to Meyers Leonard and destroys him with a spectacular dunk. Coach Pop said that the Spurs starters were going to play to improve their rhythm. I think that’s how Darby Crash and the Germs became really great musicians. The regular season mercifully ends on Wednesday Night at 8:00 PM in Utah against the Jazz, who are still in a tussle with the Clippers for the fourth playoff spot in the West. It’s starting to look like the Spurs might be going into the playoffs with a three game losing streak. None of those games had any impact on the Spurs playoffs standings, but they might have an impact on their confidence. One thing caught my eye at the end of the game. As Vonleh’s shot went through the basket as time expired, Pop was smiling and laughing. Perhaps he was amused at the cruelty and irony of life, but maybe also he was a little happy that he had something to show his players about what happens when you don’t play hard enough to win. If you have to learn a lesson like that, it’s probably best to do that in a game that doesn’t count for much. Austin Spurs Watching Party—I’ll be hosting a party in my back yard in Austin for either Game 3 or Game 4 of the Memphis series. I’ll know the exact date when the playoff schedule is released late Wednesday night. Watch this space.